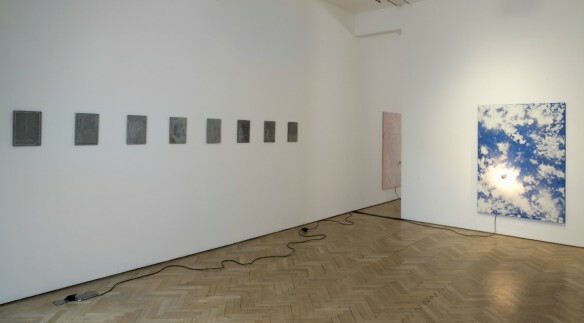 ‘Some Sky’ is Toby Christian’s first show at Vigo. Christian’s expansive practice centres around his written responses to objects, which range from rare museological artefacts to more familiar domestic items. Appropriating the descriptive style of the film treatment, written in the present tense, his texts describe the minutiae of objects, surfaces and interiors. Some Sky is an extension of Christian’s interest in these imagined settings, and brings together two new bodies of work. A series of drawings made in coloured pencil on rough concrete tiles suggests a group of plans whose plot is equivocal. Many of the drawn plans here are punctuated with a series of scratches, grooves and notches, made with the artist’s keys. These marks imitate those found unexpectedly on car doors, public monuments and bar-room tables, or tallies made on walls to mark time, and are used to emphasise and trace parts of each two dimensional armature. Bracketed asides are designated to the title of each of these plans, to associate each drawing to a more tangible thing (-marquee, -magnet, -mask). Offering an inverse viewpoint, a series of large illuminated wall mounted panels collectively present an itinerant depiction of the Earth’s atmosphere, where atmospheric matter is suggested by spattered, scrubbed and washed chalk. These works are an iteration of Christian’s recent large-scale, immersive installation The Plastically Parroting at Intermedia, the Centre for Contemporary Arts, Glasgow, which featured an 11 x 6 metre suspended ceiling – an anachronistic patchwork awning of various portrayals of the sky. Here, chromed light bulbs, protruding from the surface of each work, reflect light back across the textured surfaces to locally highlight crumbs of chalk and the textured surface of their wooden painted support. This illuminated surface, punctuated by superfluous nails that throw additional slender shadows, is intermittently on view, controlled by a domestic electric timer, usually employed to suggest the presence and activity of a person in a vacant property. Toby Christian was born in 1983, Boston, Lincolnshire. He lives and works in Glasgow. Recent solo exhibitions include A Bunch of Keys, NAM project, Milan (2015); The Plastically Parroting, Intermedia, Centre for Contemporary Arts, Glasgow, (2014); A Belgian Fence, RH Contemporary, New York (2014) and The Tread and the Rise, Baró Galeria, São Paulo (2013). Recent group exhibitions include Quiz, curated by Robert Stadler and Alexis Vaillant, Galeries Poirel, Nancy (2014), Detours/After Detournement, Enclave, London (2014) and Unseen Blows, Seventeen, London (2012). In 2012 Christian gave a reading his articular lung at the Waterstones flagship store in London, and in 2013 his first book of writing Measures was published by Koenig Books, who will publish his second book, which he is currently working on. In 2012 he was included in the international survey 24 Artists to Watch in Modern Painters magazine, and in 2010 was included in Frieze magazine’s yearly Emerging Artists feature.